Here at KKC we love the Bible Crafts for Kids because we have so much fun just testing our new ideas. Here is one that we highly recommend as a success. Make a "Guess Who" game. 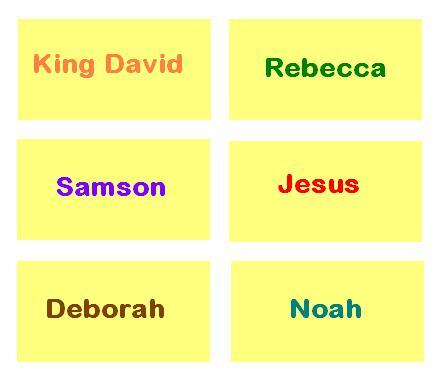 This is a bible project, game, and learning tool all rolled into one. Your children will learn and remember a lot of details about many faithful and unfaithful men and women recorded in bible. 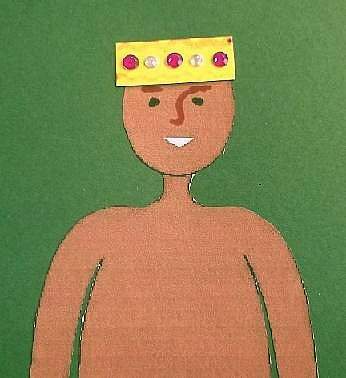 This craft is fun because kids from 5 years old upward can all help make the characters. Here`s what to do! 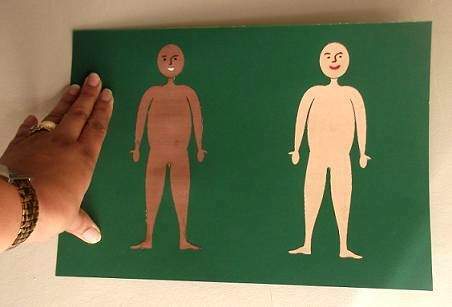 Draw and cut out 2 identical figures from 2 different colours of card. You can download ours or let the kids make their own. Stick both onto another sheet of A4 card. 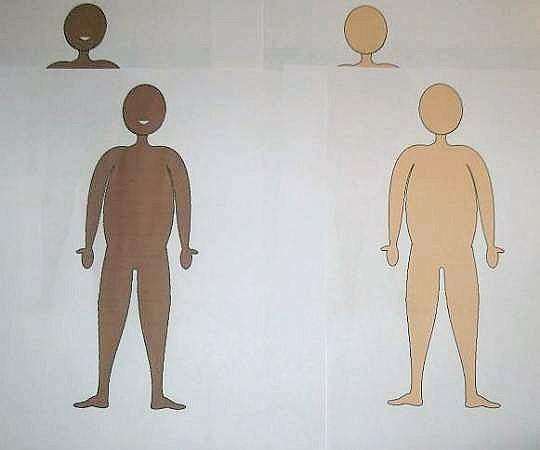 One figure represents a male the other female. I have cut 2 of each so they can be used as templates to make clothes and accessories from bible times for the characters. First, have the children do some research and find out more about the life and times of one particular person mentioned in the bible, then make clothes, crowns, jewelry, instruments, tools and accessories from different colours of paper, card, fabric or felt and decorate them with other materials like sequins, beads, cord, wool etc. They will be for clues to identify who the mistery figure is. 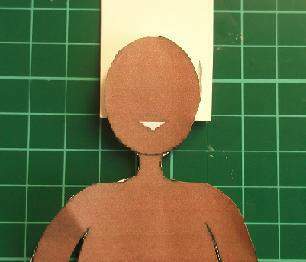 For example, if you want to make a Jewish king`s crown, place the head of the figure onto a piece of card and mark at each side of the head. Draw a band and cut it out then stick some sparkly gems in a row. 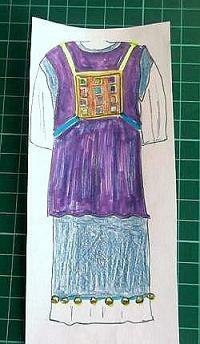 Make the clothing for a Jewish Priest in the same way. 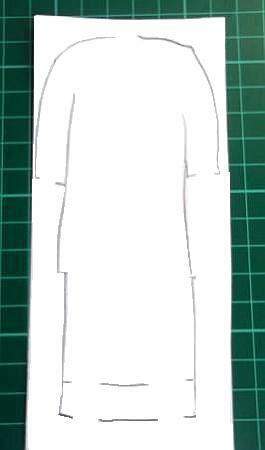 Draw the tunic around the figure to get the right size. Join all the gaps and add the design and colours. Now cut it out and place it over over the figure on the card. Do the same with the turban. But the player needs to pick a card! 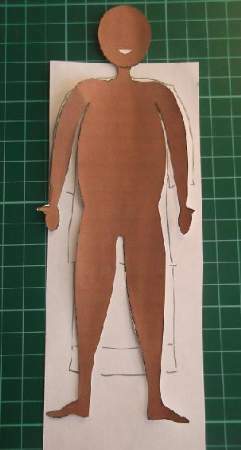 The children can now print or write and cut out names from the men and women they researched and paste them onto cards. Turn the cards down and let the first child pick from the top. When they see who the character is they do not let the others know but one by one place items of clothing or accessories onto either the male figure or the female one. The other children have to guess who the character is by each item placed on the figure. The lady with the pot in the top picture could be Rebecca and we can see that the man is a priest. Making and adding some more items will help us know exactly who they are. That is how to play the game. 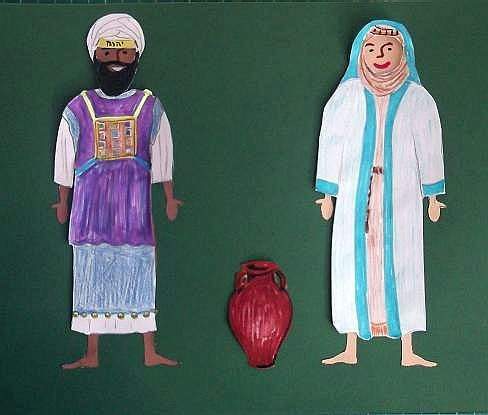 Children can have fun choosing bible characters and learning much about them, who they were, what they did, what they wore, what they had, and how they lived. This is a first step in most kid`s bible crafts. Reading from the Holy Scriptures is a daily activity that we want our children to adopt. 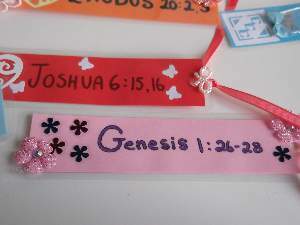 Making book marks with favourite verses written on them from each bible book can encourage them. We`ll show you how to make them look appealing and sturdy for either boy or girl.